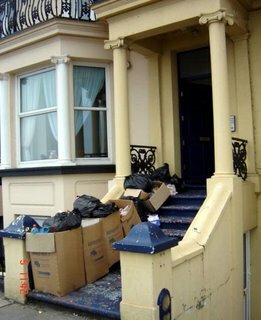 Thanet Life: We Need More Bins Please! "This is just one property this morning in Ethelbert Crescent, Cliftonville with heaps of rubbish. At least its not in the street, it often is, and probably will be in a couple of days. Notice the residents' attempt at making bins out of old cardboard boxes, we may be poor in Thanet but we're inventive. The other photo is of the alley at the back of Ethelbert Cres, rubbish as usual, often there's more. 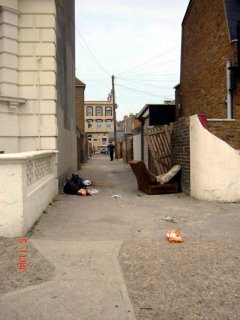 Its a real hot spot for rubbish round the Ethelbert Cres / Dalby Sq area. Lots of tenants with no cars to take rubbish to the tip. We need some big communal bins! TDC could provide them but seem to prefer letting the rubbish blow about and make work for the road sweepers. TDC end up getting it anyway, lets make it easier and cheaper to collect. Happened to ride through Northdown Park this morning and the shog dit bins were overflowing and had been for some time, by the number of "used" tesco bags adorning the refuse bins. Read somewhere that TDC need a license which they havn't got, in order to dispose of shog dit. Does anyone know about this? Apparentl dig shot is now classified as hazardous waste so the street cleaners can't remove it. What a blooming crazy world we live in! I don't think, Anon 836, you can blame the Prime Minister for your Council's failure to do its job properly. Suggest to Dr Moores that he puts this up as a question for the Council Leader. Yes, let's hear from Sandy about puppy poopy and big bins - these bins are things which will make a big difference to the appearance of Margate - they certainly worked along Canterbury Road near the Nayland Rock area, used to be torn black sacks and rubbish blowing about all along Canterbury Road, now with 3 big bins in the side streets there is no problem anymore. Of course that is the road EVERY ONE of those all important visitors drive into Margate by, maybe thats why TDC gave in and put the big bins there. So lets clean up the residents areas as well as those which visitors see. maybe TDC are going to use more of those bins????? Could be a step in the right direction.